Nestlé today has unveiled Milkybar Wowsomes in the UK and Ireland, the first chocolate using Nestlé’s new structured sugar to reduce sugar by 30% versus comparable bars. The new Milkybar Wowsomes achieves the sugar reduction using only natural ingredients and with no sweeteners. It has milk as the No 1 ingredient, contains crispy oat cereal and is a source of fibre. The sugar reduction comes thanks to a scientific breakthrough that Nestlé first announced in 2016. Researchers at Nestlé changed the structure of sugar using only natural ingredients. They created an aerated, porous sugar that dissolves more quickly in the mouth. This allows someone to perceive the same sweetness as before while consuming less sugar. Nestlé says it is committed to further advancing the nutritional credentials and wholesomeness of its children’s confectionery, and plans to apply the sugar technology to further children’s chocolate brands. The goal is to reduce sugar content naturally while maintaining great taste. “The innovation is in line with Nestlé’s purpose of enhancing quality of life and contributing to a healthier future,” says the company. Nestlé teams in Switzerland, the UK and the Czech Republic took just over a year to turn the structured sugar innovation into a new product. Milkybar turned out to be a natural fit for the structured sugar. Launched in the UK in 1936, Milkybar is one of Nestlé’s most iconic chocolate brands. It is a popular choice for parents in the UK for their children thanks to its mild and creamy taste and high milk content. In 2007, the brand moved to all-natural ingredients. In 2017, milk became the No 1 ingredient in the recipe. 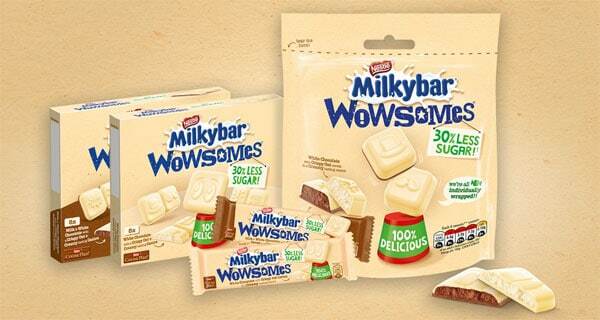 Now in 2018 with the launch of Milkybar Wowsomes, the brand is offering a new alternative with 30% less sugar. For more on Milkybar Wowsomes, read the UK news release (pdf, 450Kb). For more on the new sugar, read the fact sheet (pdf, 500Kb).